Mehdi Mahmoudian a journalist and a member of the “Association for the Defense of Political Prisoners and Human Rights in Iran” and a member of the Reformist party “Participation Front” is in critical health condition at Rejaei Shahr prison. Mahmoudian was arrested following the rigged 2009 presidential election. He was one of the whistle blowers exposing the horrific and deadly conditions in Kahrizak prison, he was arrested on September 16, 2009. He was later tried and sentenced to five years in prison. Mahmoudian has been in prison over 700 days without being granted furlough and despite recommendation by the medical examiners office, his needed medical furlough is denied. Following is translation of an article regarding Mahmoudian’s critical health condition as posted on Jaras news site. Reformist political prisoner Mehdi Mahmoudian is in critical health condition. His health is deteriorating day by day but the official continue to deny him needed medical furlough. Three months ago the officials promised Mahmoudian and his family that if they stop giving press interviews about his health condition, they will transfer him to Evin prison and will also grant him medical furlough. But despite the forced silence of the family during this time, officials have not kept their promise. Mahmoudian’s family is very concerned about his health. He has also been fasting since the start of Ramadan (Moslem’s fasting month). His poor health condition can deteriorate due to poor nutritional value of the food in prison. A source close to Mahmoudian’s family, expressing great concern for the serious health condition of Mahmoudian told Jaras, “His lung problems have become worse, he is on medication. He suffers from severe headaches and has blurred vision. When he tries to stands up, he has to hold on to something otherwise he will fall down due to dizziness and temporary vision lost. As a result of his hunger strikes, he has also developed kidney problem. After examination by doctors from the Medical Examiners office, they recommended two weeks of hospital stay for him. They indicated that Mehdi’s general health is in dire condition, he may have also suffered some brain damage. But when Mehdi’s family inquire with the Prosecutor’s office, they are told, the office is waiting to received medical records. This source also points out how worried the family are, particularly Mahdi’s mother. He continues, “They have told Mehdi’s family that they will grant him furlough only under the condition that they stop giving press interviews. But it now has been about three months since their promise and they still have not granted him furlough. This source close to Mahmoudian’s family talks about the extreme hard conditions and the pressures that are placed on the prisoners in Rejaei shahr prison. He adds, “They informed Mehdi’s family that his name was on the list of prisoners to be granted furlough. But after three months the officials denied having said such thing and told the family that there has been a mistake. After seven months they only allowed him one face to face visit with his family. This makes is so difficult for them, they won’t allow them to hug and kiss or get close to each other. The visitations are done under heavy security atmosphere. He adds, “They only allow them to be in prison yard for fresh air in the peak heat of the afternoon from 2 PM to 6 PM. This practically eliminates outside fresh air for the prisoners because in that heat they can’t go outside. We have reliable information that ten to fifteen people have died of cholera but the officials are remaining silent about it. Sanitary conditions and food quality are so low that we are extremely concerned about the prisoners health. It’s been almost eight months now that they have banned all phone communications and face to face meetings in Rejaei shahr. They have also quarantined some of the political prisoners and are keeping them in a separate hall and won’t allow them to have contact with the outside. It should be noted that Mehdi Mahmoudian was among number of other Rejaei Shahr political prisoners who issued a statement asking for the international human rights organizations to send their representatives to Iran to investigate the human rights situation. 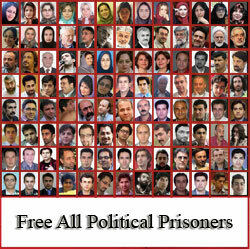 In their statement, political prisoners stressed that the political conditions governing the country, the oppressive measures that are taken, the oppressive judiciary system, the restrictive situation inside the prisons and the interrogation process has reached a critical point that requires the human rights organizations, particularly the United Nations to send representatives to Iran to investigate the human rights violations. Their statement stressed the point that the investigative teams should prepare and publish a report to the international community on the human rights situation in Iran. They should speak with representatives of political and religious dissidents. They should inspect the prisons and hold talks with the families of those who have suffered in the past years and in particular families of those who were killed.